Designed in a compact, laptop-style portable ultrasound, the Medison MySono U5 3D/4D ultrasound brings the performance of a full-sized system in a truly portable option, ideal for point-of-care, emergency, general imaging, and other uses. 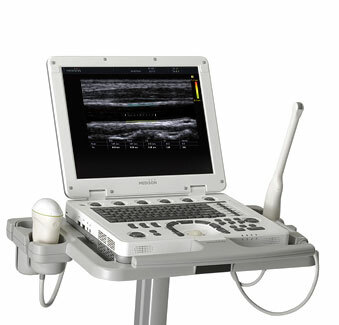 The MySono U5 ultrasound also aims to improve your clinic’s productivity and efficiency with its advanced vascular package, Auto IMT, high-performance linear probes, ergonomic control panel, and QuickScan operativity. We like the used Samsung/Medison MySono U5 for its performance and low price. This is a great solution for budget-minded professionals who would like to purchase something newer, and less expensive, than top competitor GE Voluson i for sale. Medison has produced 3D/4D ultrasounds since the mid-late 1990’s and is very experienced in creating solid 3D/4D ultrasound machines.